After a Christmas road trip to the Bay Area to attend various family festivities, at which yours truly consumed far too many rich foods and/or sweet goodies, we've returned to what passed for normal here. The building project is starting back up after a short hiatus to allow Dino to get a few items accomplished - the roofers finally started getting the actual roof on this week. Saturday, I hitched a ride with Dino to the red gate. He had a meeting to attend in Madera, so he headed left up the hill, while I headed right toward the river. I was torn between enjoying the lovely day and fretting about the drought. It was a great day for birding. 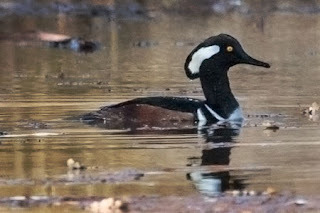 Number 102: Hooded Merganser: I saw two males and a female. Number 103: American Wigeon - not sure how many, at least four. I got photos of the Wigeons but again these images were good enough to confirm the ID but sort of embarrassing otherwise. 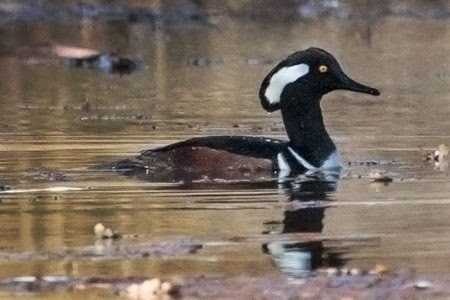 This Hooded Merganser shot isn't the greatest either, but at least it gives you the idea. 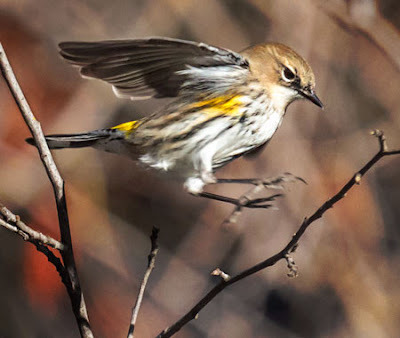 I had some fun taking pictures of this female Yellow-rumped Warbler, a species I am quite fond of and who has been given the nickname Butterbutts. I'm sure I've discussed Acton Grade in the past. The cute little snow I mentioned last time translated to snow and ice all the way up the grade - and it stuck for days. Tuesday morning (the week before Christmas) was a more eventful drive to work than usual; in fact it took me nearly 5 hours to get there. I was making my way up the grade, repeating my crappy-road mantra "slow and steady", when I turned a corner and there in front of me was someone else's pickup truck, stopped and blocking the road. The mantra changed to something more like "are you kidding me?". I lucked out in that only a few feet ahead of me was a great spot to pull over so my truck wouldn't have to stop in the middle of the road. I rather thought that being out of the way would be useful later on when whoever was going to have to unjam this mess showed up. And in case you are wondering nothing was going to tempt me to attempt to back down the hill. By some miracle of modern technology, I was able to get a cell signal and called the sheriff. A few minutes after my call, one of the men working on our house remodel started down the hill but he was still on good pavement and was able to back up and out of the way. I told him to go back up to the top of the grade to prevent anyone else from starting down. I'll spare you a lot of the other details, but in time a sheriff's deputy showed up at the top. And finally, a county road crew showed up at the bottom. Some time after that, a big tow truck arrived, also at the bottom of the hill. All of the rescuers put their heads together and the plan turned into: chains from the tow truck were walked up the hill, attached to the stuck truck and to the sheriff's vehicle (big 4 wheel drive thing), and the truck was hauled out. I spent my time waiting by watching birds, enjoying the view, and generally practicing my patience skills. Occasionally, someone would ask to use my cell phone. I had dressed appropriately in lots of warm layers, had my hat, gloves and uggs on, plus had a stash of snacks in my truck so I knew I was fine. 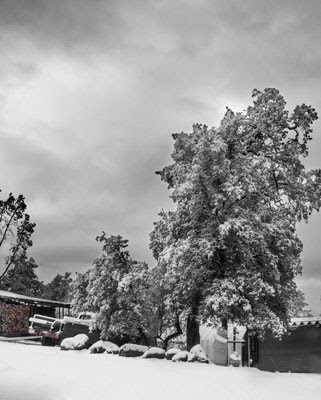 Friday night/Saturday morning brought us a couple inches of snow. According to Dino's fancy weather station, that translated to a half inch of rain. OK, better than nothing, plus all the white stuff was pretty. 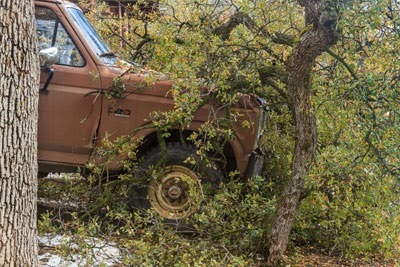 When I took the above picture of the tree and the snow with the woodshed and the Ford in the background, I did not know that the Ford had narrowly escaped being crushed by a falling oak limb. That Ford is our ranch truck..., it's not legal for the road, but since it never leaves the ranch that's not a problem. This looks like a big mess, but the limb came down just in front of the truck. To get the limb off, Dino put forks on the front tractor blade, stuck the forks under the limb and lifted. 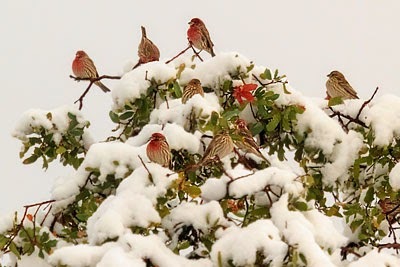 I had all sorts of fun taking pictures near the bird feeders of our usual visitors, this one is of a treetop full of House Finches. I think it looks a bit seasonal, like a Christmas wreath. Number 101 - Golden-crowned Kinglet. 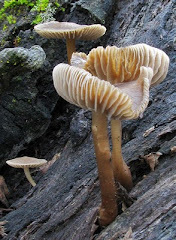 Regrettably, the picture I took was good enough to confirm the ID, but not good enough to share. These little birds have almost certainly been around as they are not rare by any means, but we just hadn't seen one yet. What a great year for birds!